"For a less spicy version, cut down on the curry powder. Serve over hot boiled rice." Heat vegetable oil in a skillet over medium heat. Cook ground beef until browned and cooked through, 7 to 10 minutes. Transfer cooked ground beef to a plate to drain; reserve remaining oil in skillet. Return skillet to medium heat with residual oil. Add onion, garlic, and curry powder; cook and stir until onion is almost tender, 5 to 7 minutes. 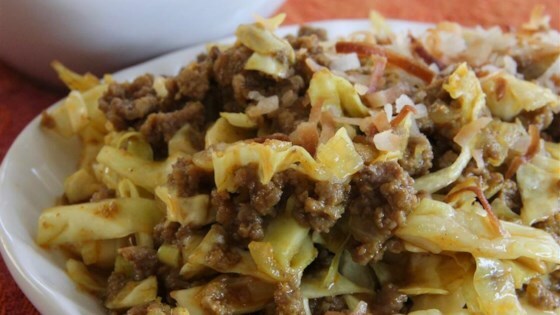 Stir cooked ground beef and cabbage into onion mixture; stir in ketchup, chutney, and salt. Sprinkle on a little water to prevent burning, but not enough to make the curry wet. Cook and stir until cabbage is just tender and flavors have combined, 7 to 10 minutes more. This was much sweeter than I anticipated. I added extra curry powder and some cayenne pepper which simply turned it into a sweet heat. If I make this again I'll omit the chutney and ketchup. Really good and tasty. Even my daughter loves this and she "hates" cabbage. Used a Madagascar curry powder and it missed the spot, next time I'll use a Bombay powder and add some sweet curry powder to balance it out.